Duyckinick, Evert A. Portrait Gallery of Eminent Men and Women in Europe and America. New York: Johnson, Wilson & Company, 1873. Giovanni Maria Mastai-Ferretti (b. 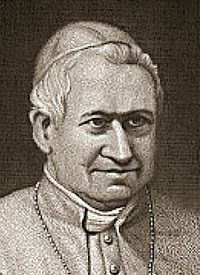 May 13, 1792, Senigallia, Papal States - d. Feb. 7, 1878, Rome), head of the Roman Catholic Church whose pontificate (1846-78) was the longest in history and was marked by a transition from liberalism to conservatism.1 . On 8 December 1864, Pius issued the encyclical Quanta Cura with the Syllabus listing eighty of the "principal errors of our times." The eightieth "error" was that "the Roman Pontif can or should reconcile himself to and agree with progress, liberalism, and modern civilization." The first Vatican Council opened on 8 December, 1869. On 13 July, 1870 it was decided that the Pope was Infallable when he made pronouncements ex cathedra. 1. New Encyclopaedia Britannica. 1989. v.9, p. 485.